Ticket to the Stars is a Quickspin based slot machine for which reels and 5 and Paylines are 25. Play this slot using your desktop or mobile or even tablet with coin sizes of 25p per spin to £100 per spin. 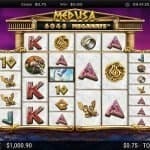 The game has a jackpot of 500 times on your total stake and it features 3 bonus rounds. 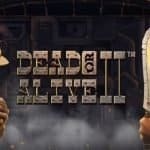 The free spin feature if activated gets you 15 to 25 free spins. 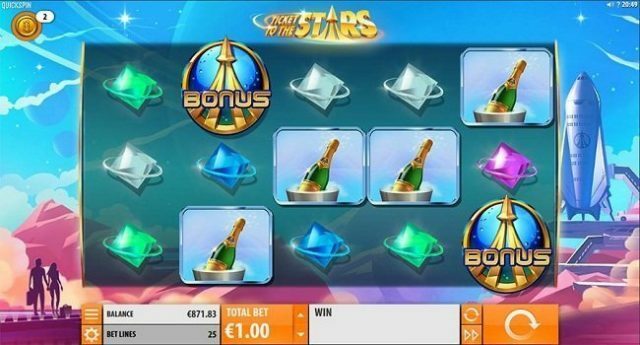 Ticket to the Stars slot looks fantastic on board. The game will take you to the stars where you will see symbols such as red, pink, blue, green and clear gemstones as well as stewardesses and pilots, luggage, champagne bottles and butler robots. The game comes in with a Swooping Reels feature in which the symbols will explode and new symbols will take place on the reels and you will get winning combinations. The game is being set on a space station and it has cartoon style graphics. 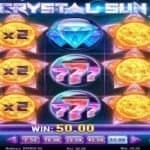 The pilot symbol of this video slot is the highest paying symbols and it will give you 1,6 or 20 times on you total stake if you lucky enough to land 3,4 or 5 of these symbols across your payline. The pilot is the most rewarding symbol giving you 1, 6 or 20 times your stake for 3, 4 or 5 across a payline. The Free Spins Bonus feature is activated when you land 3 or more of the control tower bonus symbols. 3 of these kinds of symbols will get you 15 free spins, 4 will 20 and 5 symbols will get you 25 free spins. The game has a wild symbols as well and it replaces all other symbols on your reels except the pilot symbol. Ticket to the Stars video slot also comes in with an Unlimited Multiplier Meter feature which increases the multiplier to after every 3rd win of yours. 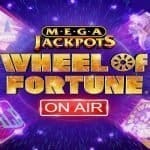 Not only will this but 2 more free spins be awarded to you during this feature. Ticket to the Stars mobile slot could get you a whooping 9,714.2 times on your total stake during free spin feature and during the Unlimited Multiplier Meter feature. If you love to play quickspin backed slot games then you can take a look at best quickspin casinos online listed below here at top10casinoreviews.com/.